Thai Prime Minister Thaksin Shinawatra says he will set up an independent commission to investigate the deaths of 78 Muslims in police custody on Monday. Most of the victims died of suffocation after hundreds of people were arrested and loaded onto army trucks during a violent protest in the country's south. 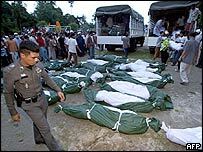 In a televised address, Mr Thaksin sent condolences to relatives of the dead and vowed to punish those responsible. But the incident has already provoked more violence in the troubled region. At least 19 people were injured in two bombs in Yala province on Friday, just a day after a blast killed two people and injured many others in Narathiwat. Looking tired and sombre, Mr Thaksin addressed the Thai people on Friday, saying he would set up an independent commission into the events which unfolded last Monday. "The government must not conceal any fact, as the government has no hidden agenda," Mr Thaksin insisted. He said the commission would be chaired by a former parliamentary ombudsman, Pichet Sunthornpipit, assisted by experts on legal issues, Muslim culture and crowd control. He began his speech with a summary of the year's troubles in the south - which have led to the deaths of more than 400 people. Mr Thaksin insisted that religious prejudice had played no part in his management of the southern region - which is mainly populated by Muslims. He blamed Monday's high death toll on bad decisions by lower-ranking military officers, and a shortage of army transport trucks. Some analysts will interpret his resolute performance as a demonstration of his strength in a time of crisis. But according to the BBC correspondent in Bangkok, Kylie Morris, the address fell well short of many people's expectations that Mr Thaksin might dismiss senior army officers or even offer an apology. Monday's tragedy began when a protest outside a police station in Takbai, in Narathiwat province, turned violent. Seven people were killed in clashes with security personnel, and a further 78 died after being suffocated or crushed when about 1,000 people were loaded into army trucks following their arrest. The incident fuelled anger among Thailand's Muslims. At Friday prayers across the region, people were both angry and sad at the week's tragic events. "Why did this have to happen to our Muslim brothers?" said Mayawewe Keada, a worshipper at the Wadi al-Hussein mosque, about 50 km (30 miles) from the scene of Monday's protests. Muslim leaders have warned of further violence, and two bombs exploded in Yala province on Friday, injuring at least 20 people. On Thursday, another deadly bomb hit the region - targeting a bar in Sungai Kolok, on the Malaysian border. Two people, reportedly a Malaysian tourist and a Thai woman, were killed.